Memorial day always brings a barrage of facebook and twitter gratitude. Pictures of Arlington, rows of crosses, flag draped coffins lining the innards of a plane ready to fly our heroes to their their final rest at home. And the photos are always accompanied with simple offerings of ‘Thank You’ or ‘Grateful’ or ‘Freedom isn’t Free’. I understand the sentiments and am grateful as well. But, for me, those images evoke a somewhat different attitude. They are potential reality; an intimate truth I begged God daily to keep from me during my brother’s and Superman’s deployments — a desperate hope that no one would ever have the opportunity to post my loved one’s flag draped coffin picture on facebook with clichéd messages of thanksgiving under it. I’ll take my living husband/brother over “Grateful” every time. But here we are. These are the choices my soldiers have made. To do hard things. And sometimes in their choosing, they find themselves in places and situations where the potential becomes sacrifice. And in their sacrifice, you and I remain free. Free to do what? Pursue our passions? Make more wealth? Worship God in the open? Have a long weekend picnicking with family and friends? I like all these things and I regularly engage in them. We call this living the American Dream. But, I don’t think these things are the core of the American Dream. The American Dream is doing hard things and sharing the blessings which inevitably follow. The rest is bonus. Today, Superman and I celebrated Memorial Day at our gym by doing “Murphy”. It’s one of the hardest named crossfit workouts — named in honor LT. Michael Murphy. 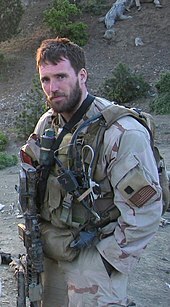 “Murph” was a Navy SEAL, who died June 8, 2005 during a combat mission in which he exposed himself to enemy fire in order to secure a clear signal from his headquarters, leaving his position of cover then continued battling until dying of his wounds. He was posthumously awarded the Medal of Honor in 2007 – the first person awarded for actions in Afghanistan, and the first U.S. Navy member to receive the honor since Vietnam. “Murphy” is brutal: 1 mile run, 100 pull ups, 200 push ups, 300 air squats, 1 mile run – wearing a 20 lb. vest (there were options – Superman and I chose the ‘no vest’ option and it was still horrendous). When Murph was alive, he loved this workout and called it ‘Body Armor’. After his death, it was re-named “Murphy”. About half way through, with rivers of sweat rolling down my face and a fair share of the gym floor’s dirt stuck to my legs and stomach, I remembered Murph. I thought of him doing this WOD. I thought of his rivers of sweat, stuck on filth, weighted vest adding extra resistance. I thought of how he loved this tough, ugly workout. I thought of the hard thing he did that day in June. Suffering through a hard workout in honor of a fallen SEAL was a neat way to observe Memorial Day and even enjoyable (weird – I know). But it isn’t worthwhile unless I allow the practice of doing hard things take hold in my everyday life. Hard things that aren’t about me, but about others. Putting first things first. Leaving a place better than I found it. Blessing people even when I don’t feel like it. Living life abundantly. Being grateful is good. Saying thank you on facebook and re-tweeting Memorial Day slogans is appropriate. But if we don’t spend our lives as Americans doing hard things and inviting others into our abundance, our gratitude is hollow and their sacrifice is in vain. Your turn: What’s your take? What hard thing might you need to do? Or, what hard thing are you already doing? Thank you, Kathleen! You’re encouragement is much appreciated! I love your comment, Ashley. So often I need to “quit [my] bitching” and move through discomfort/pain/frustration…. we will do what we practice, right? Either “bitching” or blessing : )! !